← The AHC’s Carlson Intern sheds some light on the process of processing! One of my favorite “B” movies from the 1950s is a film called The Wasp Woman, released in 1959. The film is about a woman named Janice Starlin who is the CEO of a cosmetics company. As she is quickly losing her youthful looks, she decides to inject herself with the queen wasp’s jelly. Coincidentally, a string of murders rocks the city. It becomes obvious that Janice’s vanity is the culprit. If she hadn’t been so intent upon recapturing her youth, the vile creature that emerges when she injects the jelly would not have been unleashed upon the city. Promotional poster from the film. Forrest J. Ackerman papers, Collection #2358, Box 137. At the same time, Janice is constantly criticized for her looks. It is presumed that she was only the CEO of the company due to her former beauty. The gang of cronies waiting to take her place is a group of men in gray flannel suits, snickering behind her back and anxiously awaiting her downfall. And of course, they aren’t the ones who bring on that downfall. She does the work for them. There are some interesting elements to consider in The Wasp Woman. The timing of the plot is similar to many other sci-fi “B” movies of the time as the movie is only about an hour long. Janice’s downfall comes in a matter of minutes, and although most of the film is about how her character develops from a beauty queen to a vile monster, I sort of wished the ending of the film offered a longer reflection on what the story meant. There are so many similar themes to King Kong, a film that would have been familiar to both the creators of the film and its audience due to King Kong’s many re-releases, particularly in the fifties. The idea that beauty killed the beast is predominant in both stories. Particularly in The Wasp Woman, there is a sense that beauty is somehow sinister. The possessors of beauty, young women, can’t be trusted. It is tolerated for its aesthetic power in youth, but when it is no longer there the power that has been afforded to the beautiful is now overwhelming. Therefore, women can’t be trusted with power because the need for aesthetic recognition can turn them, quite literally, into monsters. This is a common sentiment in film throughout the postwar era, particularly in science fiction. In many films, women are seductresses with malevolent intentions. The interesting thing about The Wasp Woman is that the main character doesn’t start out a monster, like so many other feminine characters in other post-war films. Instead, she merely is a person who is prone to insecurity. The feminine element in The Wasp Woman is a great deal more human (literally) than in other films. If the fear of the aesthetic, or the power of beauty, is so paramount on so many different levels it is clear that appearances were more intimidating than they originally seemed in postwar America. Hence, women could easily be turned into objects of fear and attraction when in all actuality America was still a misogynistic environment. 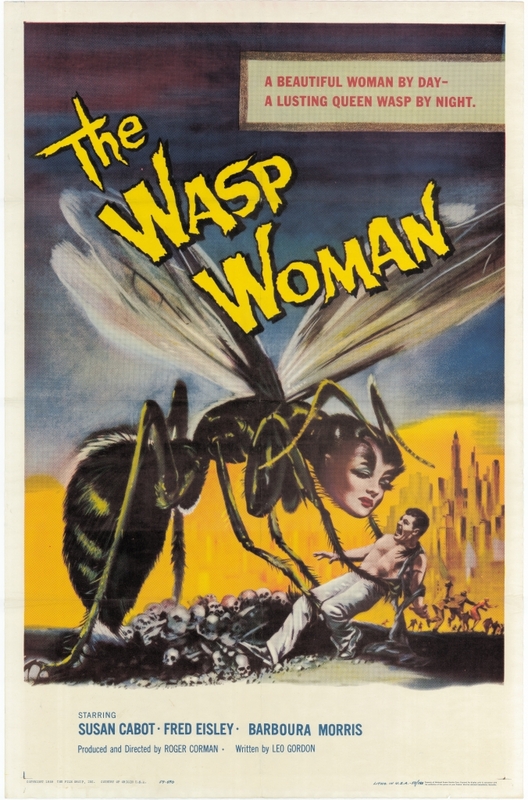 The Forrest J. Ackerman collection has a great movie poster from The Wasp Woman. It’s a wonderful artifact, although it doesn’t seem to relate to the film as much as it could. The poster portrays Janice as a gigantic wasp with a woman’s face, while in the movie she is the opposite–a woman’s body with a wasp’s face. However, the movie poster does upend the usual monster-holding-woman formula as this time Janice, the wasp woman, is holding a man. It’s interesting to consider what happens when the woman is made out to be the monster rather than the helpless heroine. After the fifties science-fiction films began to feature female protagonists. Barbarella, a film featuring a sexually aggressive Jane Fonda, was released in 1968. Perhaps the best, and my favorite, female protagonist in science-fiction film history is showcased in a film that was released exactly two decades after The Wasp Woman. Sigourney Weaver’s Ellen Ripley, the protagonist of the Alien series, is one of the most compelling characters in science fiction. She is certainly one of the toughest, meanest, and oddly powerful characters in the history of film. Her mastery of the fearsome is something that couldn’t have quite been conceived in the late 1950s. I don’t think that Ripley could have existed without the realization of the dark feminine power that drives films like The Wasp Woman. Perhaps that is why I take such satisfaction in watching science fiction films from the 1950s, as they were not very afraid of experimenting with feminine power, even if those experiments usually resulted in malevolent depictions of women. And if it weren’t for the Forrest Ackerman collection, I would have never known about The Wasp Woman. Thankfully, I have had the honor of working through it. This is a great film to watch, and luckily for anyone with internet access, the film can be found on YouTube.